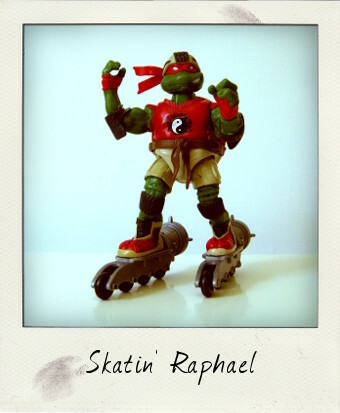 Before taking a bit of an August blogging break I wanted to leave you all with a summery action figure, so what better than Skatin' Raphael dressed up with all his sporting gear? When Playmates Toys relaunched their Teenage Mutant Ninja Turtles line in 2003 to coincide with the all new animated series they produced some truly wonderful and highly inventive action figures – robust articulation, impressive attention to detail and masses of exciting accessories for children to lose down the back of the sofa! In fact, when I found this on a market stall the other day I was pleasantly surprised to find that Raph still had his turbo powered skates, although his twin sai blades are missing, leaving him to fight with his bare fists! 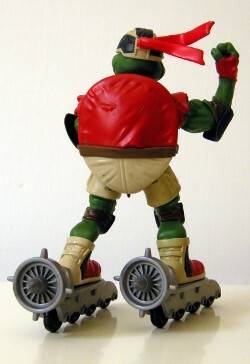 This particular 5 inch figure was part of a fun set of 2003 figures, the Extreme Sports line, which saw the TMNT action figures kitted out in helmets and padding and ready to tackle scooter riding (Leo), skateboard surfing (Mike), BMX riding (Don) and in Raph's case, in-line skating. As with the other figures in the newer Playmates line, this is a great likeness to the cartoon and accurately colour matched with Raphael created in a dazzling bright green. I particularly love the back of this figure and the detailing of the knocks and scrapes on Raph's shell, not to mention the fabulous skates which really do roll beautifully on a flat surface. He may only have the standard 5 points of articulation – neck, shoulders and hips – but the extra play factor of the skates gives this figure a whole other dimension. One for the display case!